China to launch artificial Moon for Chegdu. 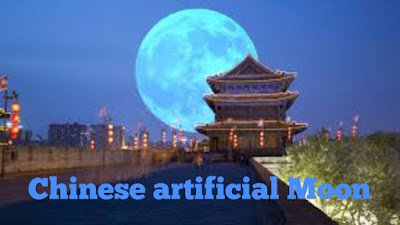 China is planning to Launch it’s own artificial moon by 2020 to replace street lamps and electricity cost in urban areas. Chengdu a city in the southern sichun province where this artificial moon Will be launched. The illumination Satellite which will shine 8 times brighter than real moon. The first man made moon will launch from ‘ Xichang Satellite Launch Center‘ in sichun with 3 more to follow in 2022 if the 1 St test goes well. Though 1st launch will be experimental the 2022 satellite will be the deal with great Civic and commercial potential. How might artificial Moon work ? The artificial moon of china would work as a mirror reflecting sunlight back to earth, according to the China Daily. It would orbit 500km above earth, roughly the same hight as the international space station. The moon orbits on average about 380000 km above earth. The reports gave no details about what the artificial would look like, but Mr Wu said it would reflect sunlight across an area between 10 km to 80 km with brightness 8 times that of the real moon.It will also revolve around earth like real moon. Impact on the environment ? Some said it will surely confuse nocturnal animals, while others says that many cities in China already suffer from light pollution. The moon would significantly increase the night time brightness of an already light polluted city, creating problems for Chengdu residents who are unavailable to screen out the unwanted light. If the light is too bright it will disrupt the night cycle of animal, micro organism, overall of nature and this could possibly affect animals. Zamya 2 briefly beamed a spot of light about 5km in diameter to earth. The light marked across Europe at 8km/he ,bef bef the satellite burned up on re-entry. In 1993, Russian scientist released a 20m wide reflector from supply ship heading to the ‘Mir Space Station’ which was orbiting at between 200km and 420km.